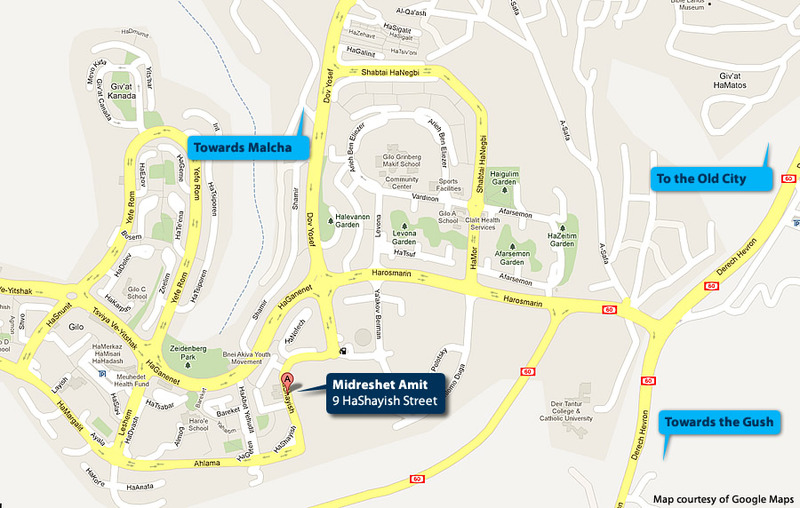 We are located in the AMIT Beit Hayeled Building in Gilo, Jerusalem: 9 HaShayish Street. From Binyanei Hauma: Take the 31 (on the side of Binyanei HaUma) to Gilo. Get off at the Unterman/Ganenet Stop (a red art statue will be on your right). Walk in the opposite direction of the bus to the nearest intersection. Make a right onto Unterman and walk up the hill. Make a right at the top of the hill (that's Hashayish Street) and walk down the street. On your right, you will pass a parking lot and basketball court with a colored fence, we are in the large white building on the right side after that with the AMIT logo on it. Walk right in and we are one floor up to the right. 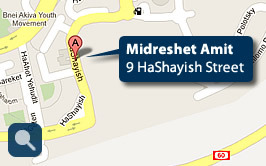 From Town: Take the 72 (faster) or 32 to Gilo and get off at the Hashayish/HaNofach Stop. Walk down the street in the direction of the bus. On your right, you will pass a parking lot and basketball court with a colored fence, we are in the large white building on the right side after that with the AMIT logo on it. Walk right in and we are one floor up to the right. You can also take the 71 (not as quick as the 72) and get off at the Unterman/Ganenet Stop (a red art statue will be on your right). Walk in the opposite direction of the bus to the nearest intersection. Make a right onto Unterman and walk up the hill. Make a right at the top of the hill (that's Hashayish Street) and walk down the street. On your right, you will pass a parking lot and basketball court with a colored fence, we are in the large white building on the right side after that with the AMIT logo on it. Walk right in and we are one floor up to the right. From the Entrance to the City (Highway 1): Pass Binyanei HaUma and stay in the right lane. Drive past Kraft Stadium and past Gan Sacher, past Wolfson Towers to Herzog Street. Turn right on Herzog until Tzomet Pat (gas station on your left; if you pass the entrance to Begin North, you've gone too far). Turn left at Pat and go all the way up the mountain (Pat turns into Dov Yosef). Go straight past the light (Junction of Dov Yosef and Unterman) at the top of the hill until you cannot go any further. Make a right at the top of the hill (that's Hashayish Street) and walk down the street. On your right, you will pass a parking lot (you can park there) and basketball court with a colored fence, we are in the large white building on the right side after that with the AMIT logo on it. Walk right in and we are one floor up to the right. From the Minharot: Make a left at the entrance to Gilo onto HaRosmarin. Go straight, pass 2 lights (HaRosmarin turns into HaGanenet) until intersection/traffic light of Unterman (on the right side it's Dov Yosef) and HaGanenet (red art statue on your right). Make a left on Unterman and go up the hill until you cannot go any further. Make a right at the top of the hill (that's Hashayish Street) and walk down the street. On your right, you will pass a parking lot (you can park there) and basketball court with a colored fence, we are in the large white building on the right side after that with the AMIT logo on it. Walk right in and we are one floor up to the right.